I was fussy cutting some fabric for hexagons and I had this very simple idea that I thought I'd share with my fellow hexagon addicts. 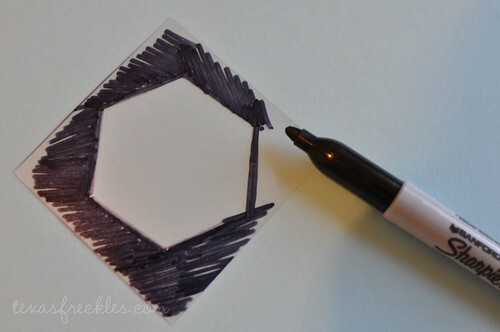 Using some template plastic (or other similar transparent plastic), trace a square the size you need for your hexagons. I'm making one inch hexies, so my squares are 2.5". 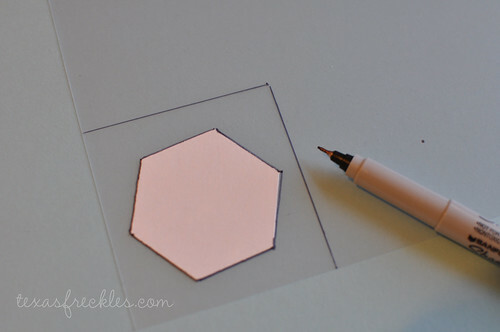 Place one of your paper hexagons onto the center of the square and trace around it's outside edge. 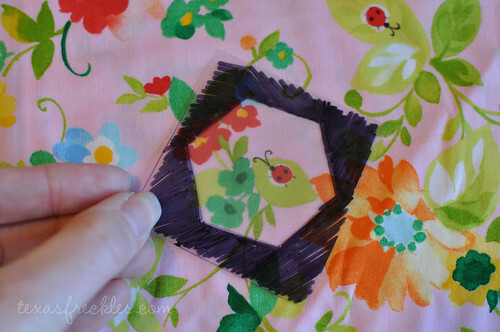 Use your paper (not fabric) scissors to cut out your plastic square and then color around the outside edges of your hexagon with a permanent marker. Be sure to let it dry before you handle it and if you use a Sharpie, hold your breath. So stinky! 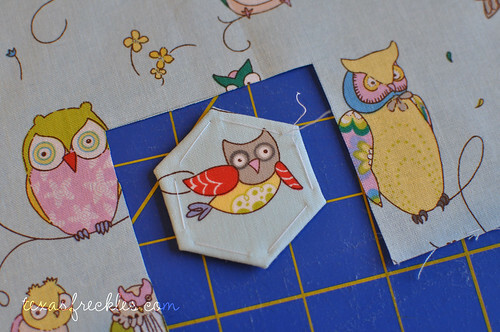 Use your new template to find the perfect fussy cut for your hexagons. 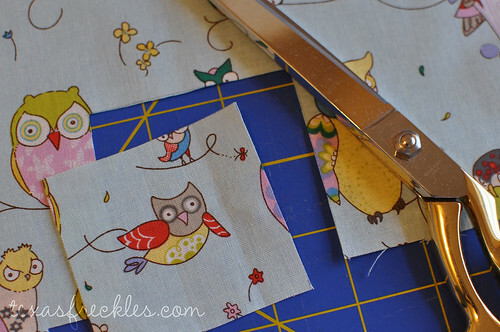 and cut it out with scissors or your rotary cutting ruler and rotary cutter. Please don't use template plastic as an edge for a rotary cutter. And, there you go. Perfect fussy cut hexagons! 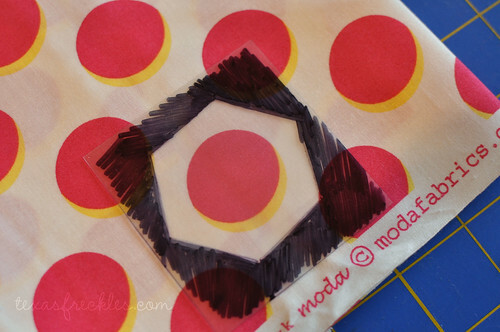 or aligning that polka dot directly in the center of your hexagon. Yea! 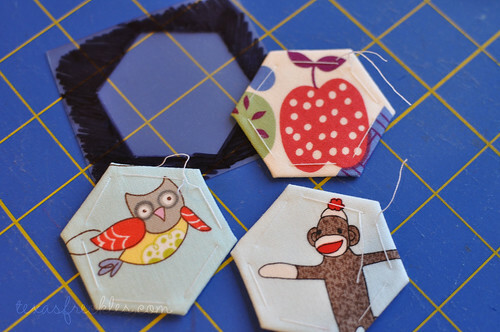 Happy fussy cut hexies! ETA - I got that template plastic at JoAnn. It's less than $2 a sheet and is in the quilting notions area. I've also seen it at Hobby Lobby. I like the heavier weight more than the super thin stuff. Great tip! 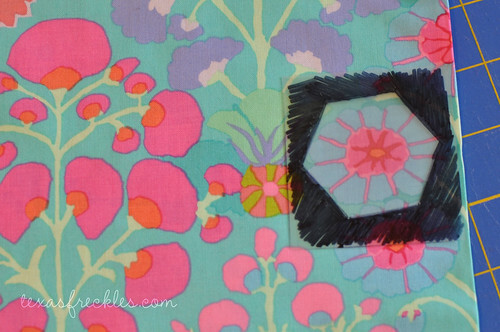 Can't say I have the patience for such small hexagons, OR fussy cutting, OR handsewing, but I admire those that do!!! Great idea!! Thank you for sharing! Okay, how did you get your comments numbered?? this is a great tip - thanks! LOVE it - will use it! What a clever idea! Thanks for posting this! Seriously awesome idea!!! I will have to go hunting for some of that plastic....or you could send me one in our next envelope....just saying. Hey there, everyone! I got that template plastic at JoAnn. It's less than $2 a sheet and is in the quilting notions area. I've also seen it at Hobby Lobby. I like the heavier weight more than the super thin stuff - it's easier to work with. Happy sewing! great tip. 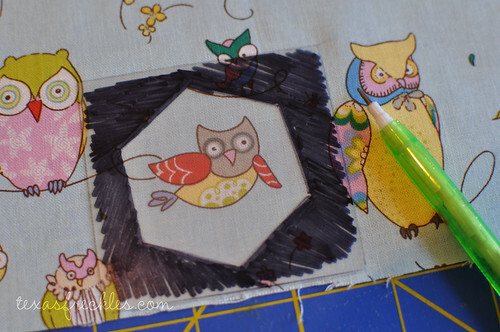 I keep thinking I'll make a hexagon quilt maybe this will give me a nudge in the right direction. I used your technique to fussy cut for another quilt project I just started. What a great tip! Thanks!! Great idea! I'm going to make one of these this weekend. 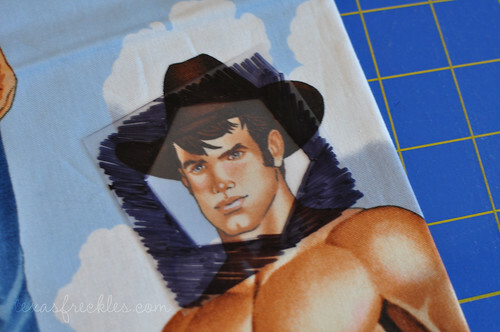 I even think I have some template plastic laying around in my craft room somewhere. I noticed in these pics that you have 2 templates...one with the hex point at the top and another with the flat part of the hex at the top. Which one is "correct"? Won't that make a little difference when fussy cutting? ok.... I am fascinated by your hexagons!!!! if I choose to use the 1 1/2 inch hexagon.... what size fabric square do I need?? Love this idea! Looks like I found a way to repurpose all that plastic packaging I refuse to throw in the recycle bin! This is a great idea! I've just started making hexes and can tell this is going to turn into an obsession. So easy and fun! 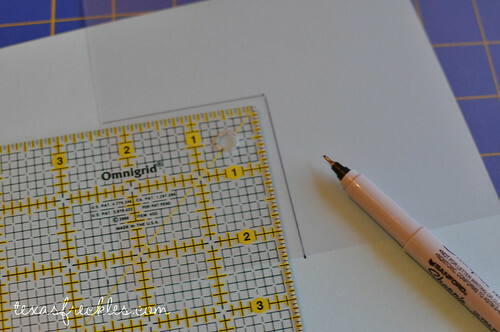 I think I will make several of these fussy cut templates and spray glue them to the roto-cut rulers I use for my squares.